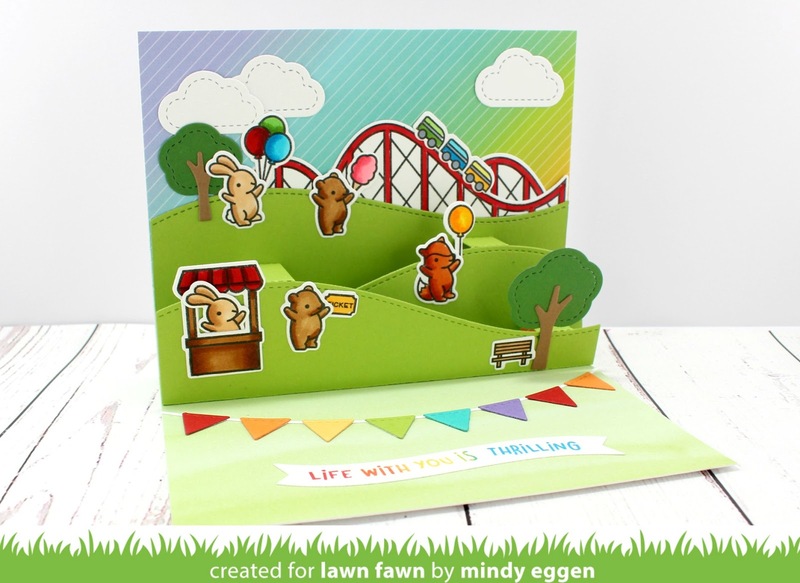 Welcome back everyone to another fun card for Lawn Fawn! I tell ya I still can’t get over how amazing it is to be working with Lawn Fawn! 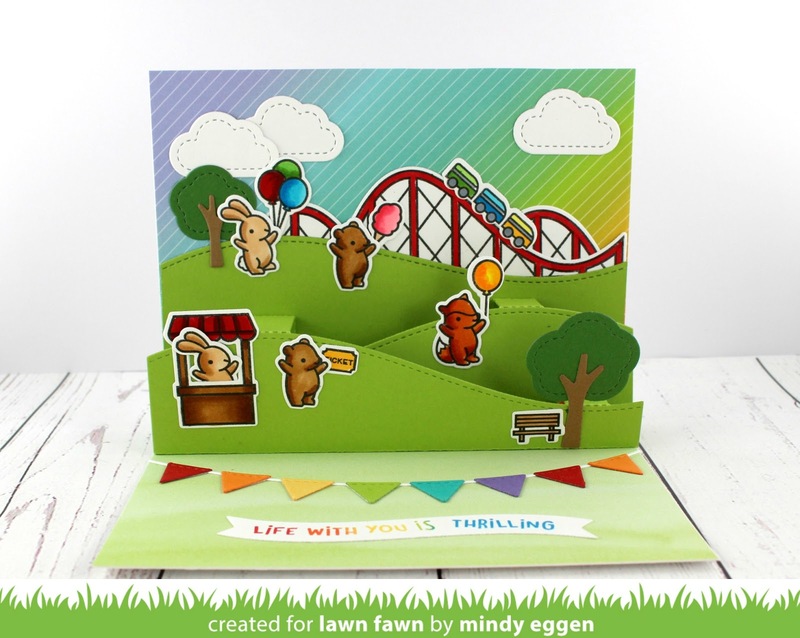 Today’s card is creating a fun pop up card featuring the Coaster Critters stamp set. I have been having a lot of fun creating interactive and pop up cards. 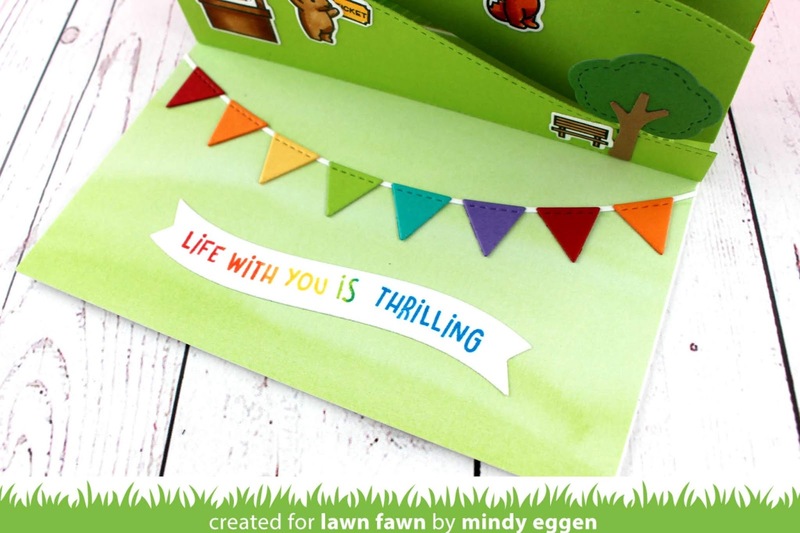 Lawn Fawn’s dies make it so easy! When I created this card, we had recently come back from the fair in town so this was all fresh in my mind. I used a piece of patterned paper from the Really Rainbow paper pack. This makes such fun skies! I also used a green piece of pattern paper from the Watercolor Wishes paper pad for the ground. I used the Stitched Hillside and Hillside Border dies to create the fun pop up background! When attaching my Stitched Hillside I don’t put adhesive all the way to the top so I can slip images behind the hills if I want. Couldn’t resist adding some fun clouds to the sky using the Outside In Stitched Clouds. I colored up a bunch of images from the Coaster Critters stamp set on Neenah white cardstock using Lawn Fawn Jet Black Ink which is copic friendly. Then used the coordinating dies to die cut them out. Since the inside of the card had so much going on, I kept the front very simple. I die cut a piece of white cardstock from the Stitched Circle Frames. I also used the Scripty For You die to die cut from a piece of patter paper again, using the Really Rainbow paper pack. Such a great paper pad! This was really fun to create! I used the Bunting Borders die and created this fun banner using various colors of cardstock from Lawn Fawn. The banner for my sentiment is from the Ocean Shadow Box Add on and I used a sentiment from the Coaster Critters stamp set. Using my Misti tool, I lined up my sentiment and then taking an ink cube, inked up each word individually. 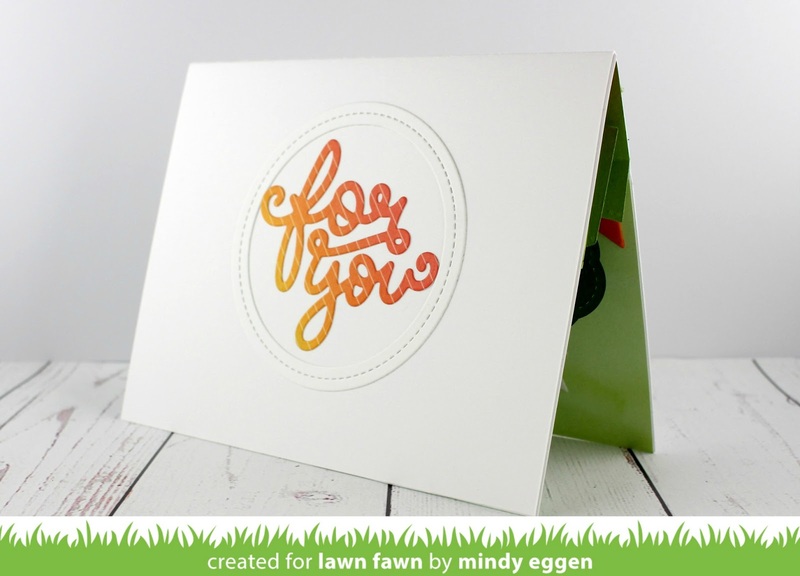 Using the Lawn Fawn ink cubes makes this super easy and who doesn’t love a rainbow ?! I have a video showing you how this all came together that you can view down below or HERE on my Youtube channel. This is a sponsored video.